Making good videos is hard. Out of the billions of marketing videos produced, only a fraction ever conveys the right message and even fewer go viral. It’s a hit or miss game, says some. But it doesn’t have to be. Careful planning will help you increase your chances of producing a great video. When you think of planning, the default is to think of the script. Many people miss the all important story board. A good video story board will help you visualize what the video will look like and make changes and come up with a final version that’s really really good before you do a single shoot. This guide covers how to make a storyboard the easy and the right way. You can start with the storyboard first even if you still haven’t written the script. It’ll only make it easier for you to write down the script. First, let’s start with the basic question. Storyboarding is one of the important steps of pre-production. It is a tool that sketches different (in most cases, critical) scenes in the video you are about to make. It basically looks like a comic strip. Each frame shows who or what is in the scene, what is being said and any other text or graphics that appear on the screen. Storyboards help work out inconsistencies in your idea for the video and the script. With its help, you can edit out the scenes that don’t add up before you go ahead and film. Following we’ve listed 4 simple steps that you can follow when making a video storyboard. Before visualizing your idea with a storyboard or writing the script, there are a few things that you need to clarify. Is it to promote your brand? Is it a tip video explaining how to use your product? Is it to get more users to subscribe to your YouTube channel? Or is it to increase online engagement? Before you make your video or even think of writing the script, you need to sit down and figure out what the objective of your video is. Once you do, what you want to do from there will be so much clearer. Video lets people see and hear your message at the same time. A visual won’t make much of an impact if it’s not accompanied by effective wording. So, choose your words deliberately and make sure your message is crystal clear. Two things that you need to keep on the top of your mind when determining the key message are your target audience and your brand identity. According to them, alter the tone and the language of your message. While you need to make sure that your video does not run over 3 minutes (remember that the longer the video, the faster you’ll lose your audience), set a timeframe that can fit your key message in and that is ideal for the promotional channel(s) that you have selected. You need to decide where you will be sharing your video. Is it on your website, on your social channels or any other video sharing platform? Once you know where you’ll be publishing it, you’ll know what kind of audience you can expect and customize your video accordingly. Once you have identified these key aspects that your video will be made up of, it’ll be easier for you to create your storyboard. Now, remember you don’t have to be an artist to create a video storyboard. While you can do with stick figures and basic sketching, you can also use a storyboard software to quickly draw a storyboard. 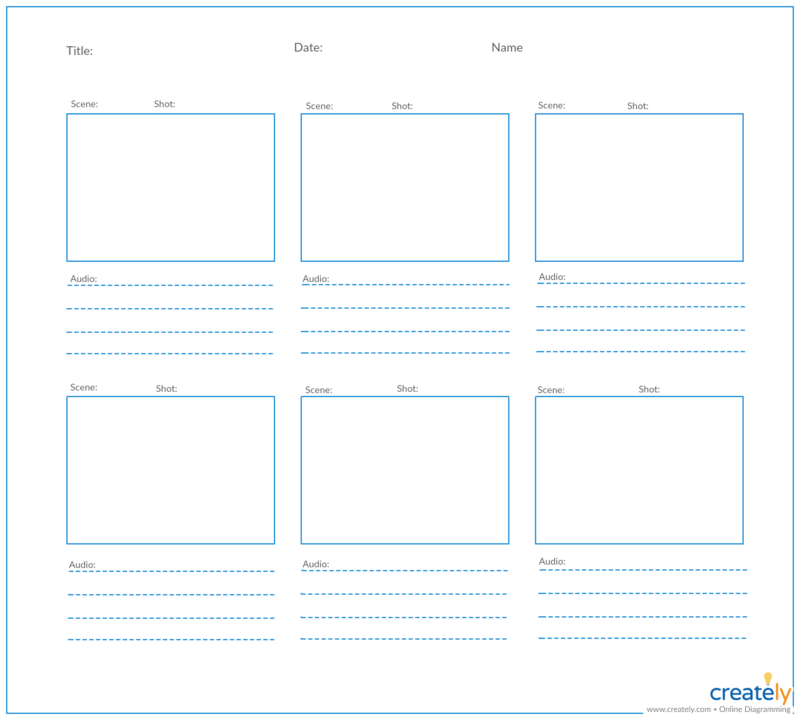 The following storyboard templates are easily editable. Click them to quickly edit them using a vast array of design shapes. Under each box where you’ve sketched the shot, write down the description explaining what’s happening, any dialog shared between the characters and additional notes such as camera angle or special effects. Your video is not yet ready to be produced. Now that you have visualized the script you’ve created or the idea you had on mind using a storyboard, it’s so much easier to make your team understand what you won’t be able to explain in words. 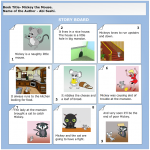 Review and revise your storyboards. If you are using Creately, you can get the input of your team using its real-time collaboration option. 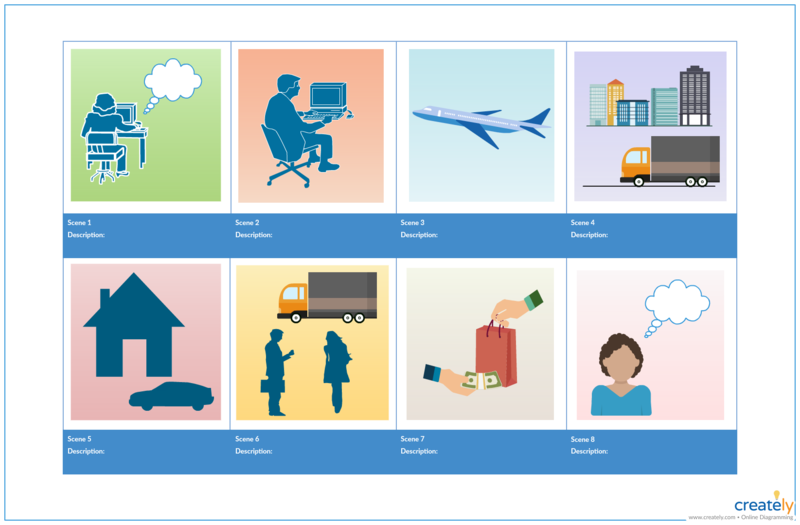 Click on the following video storyboard templates to edit them online. You can create each video shot using comprehensive Creately shape libraries or using images imported from your computer or browsed through the built-in Google image search. Once created, you can export them as an image, SVG or as a PDF file for printing. Ready to Start Your Video Storyboard? When you are making a video for your business, planning is essential. Creating a storyboard for your video may sound like an extra step in the process, but it will make production much easier and save you a lot of time.